October 13, 2013—Energy powered by solar cells, which are photovoltaics “generating electrical power by converting solar radiation into direct current electricity using semiconductors, started creating energy for satellites’ electrical systems over 50 years ago, in 1958. New, less expensive and more efficient forms of solar energy are being offered today to the consumer almost daily–the solar revolution of the 21st century. Also, taking place today, is a movement to make renewables accessible and affordable to off-the-grid communities of the world. The newest innovations in renewables could create a higher standard of living, reduce diseases, and malnutrition, as in Africa, where solar pump systems draw water from underground sources or streams to water gardens. (See Solar in Africa: Putting an End to Malnutrition, One Village at A time.). One of the newest innovations in solar is spray-on solar, which not only collects light but also collects infrared waves. Spray-on solar is in the experiment stage at the University of Alberta, where researchers are spraying nanoparticles on solar cells and testing their efficiency. 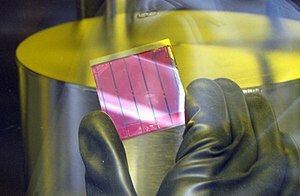 The nano-scale solar technology is “the world of individual atoms or molecules which focuses on integration of nano-scale devices and materials, constructing them into a program for a specific application,” aligning the atoms in rows 30 to 40 across to create a solar spray-on material. The solar nanoparticles absorb light and conduct electricity from the minerals, zinc and phosphorus, both plentiful materials. There is hope for reversing the CO2 level in our atmosphere with innovative people like Jullian Buriak, who have the will to make solar inexpensive, efficient, and available to all by harnessing the free energy from our Sun! Categories: Solar | Tags: Buriak, Canada, HowStuffWorks, National Institute for Nanotechnology, Printed electronics, Solar cell, Solar thermal collector, University Alberta | Permalink.